Our products have become successful because of one main reason and that is because they work! Without customers like you, we wouldn’t have the chance to have such beautiful ROG 3 cleaner reviews. Therefore we appreciate you and all of your reviews. This is my before and after pictures. Unfortunately, I only ordered the single bottle of the ROG 1 and ROG 3 products initially as I was skeptical of the reports of how this product works. However, as my shower was in really bad shape from 12 + years of improper cleaning, both by my cleaning lady as well as myself, I really ran through much of the ROG 3 bottle of product and thus ordered and received the 3 bottle kit just the other day. This is what I should have ordered originally had I known how well the products really work. As a professional floor and window covering installer for almost 30 years, I have run into a multitude of products in that time, every one of which made all manner of claims about how effective their products were.Turn on the television and we are constantly bombarded with this stuff. However, I can confidently state that I have never used a product which performs exactly as described and achieves professional results far beyond my expectations. Not only is my shower in an absolutely pristine condition, I now know I have the product on hand to ensure that it is forever maintained in this condition. While it was a lot of work to obtain the results you see, it would have been easier if all the money which was spent on cleaning materials over time even came close to performing like your product does. Many thanks for your products. Please feel free to use this testimonial in any manner that you find beneficial. I ordered the ROG1/3 right away and it arrived in the mail today. I applied it just as you and the directions instructed and let it sit while I had some dinner (about 30 minutes). Then I got to work. It took a lot of elbow grease and a second application but boy it worked just as you said! My pictures are nearly identical to yours. My tub is the cleanest it has ever been. On another note, it is not caustic at all and has no unpleasant odor. It even smells a little like wintergreen. I know it’s crazy but I am ecstatic! Especially ROG 3. The first part, not so much. But after applying the 3 just once to my 12-years old shower pan, it sparkled! I am a happy camper and my shower looks awesome. Thank you ROG! I have a three year old Kohler tub which has been great except for the non-slip surface on the bottom of the tub – it attracts dirt and is very resistant to cleaning. After doing research I tried several other suggested cleaners with no improvement and lots of frustration. Using as directed the R.O.G. produced amazing results – the tub truly looks like new!Money saving suggestion – First try just the R.O.G. 1 (White Cream Bathtub Cleaner) – it does most of the hard work and there is enough for several cleanings. The manufacturer’s instructions state that R.O.G. 1 is to clean the tub and R.O.G. 3 is to maintain it. The R.O.G. 3 spray is a nice follow-up. Thank you so much for the prompt completion of my order for ROG3. I love your product! I was skeptical that it would really clean and renew my fiberglass shower pan. It is the easiest and most efficient shower and tile cleaner I have ever used. I was especially impressed the day after using ROG3 – both the tile and the shower pan were even cleaner! I’m sold and will definitely reorder ROG3 when my supply is low! Thanks again for your attention to completing my order so quickly. 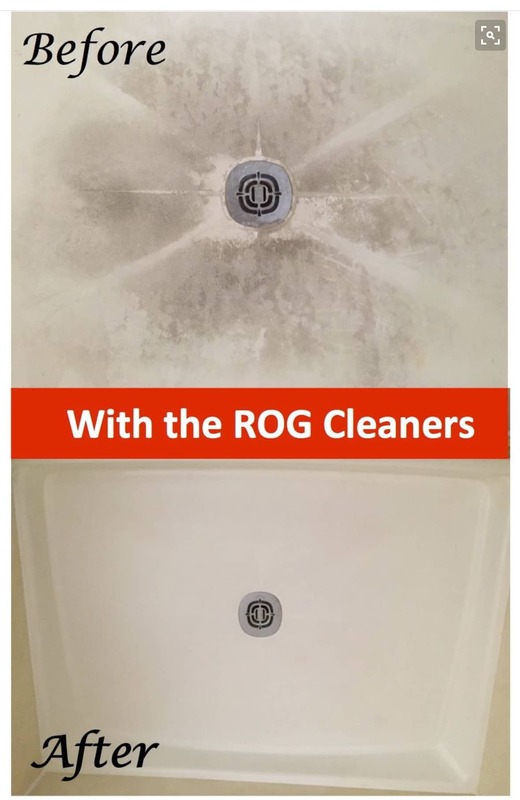 I read the online research someone did on ROG products and based on their subsequent experience ordered the ROG 3 Tub & Shower cleaner (and the recommended Dobie cleaning pads). ROG solved 3 problems for me: 1. a 10+ year build up of lime and dirt on the tub/shower floor 2. common household cleaners could not clean this and 3. some of the cleaners we tried left a dangerous slippery surface. (We had tried self adhesive strips and also rubber bath mats with suction cups.) After almost falling on three separate occasions recently on the slippery newly cleaned tub/shower floor, I looked on line and found that the problem was that, according to ROG, the original non slip coating had been covered over by the limestone/dirt residue and the solution was to use their product to clean down to the non slip coating. It cleaned like new or better than new and the non slip feature was restored. No grunge, no slippery dangerous tub condition. Sparkling. Perfect. BTW, I followed their instructions to the Letter. This item is a God-sent. I had a very difficult tub to clean. I had put so much elbow grease into the task and I was getting no where fast. This item did the trick with only a little effort, compared to what I had been doing. Now my tub looks brand new! For years I have looked for a product that cleans fiberglass shower floor pans and I finally found it. I knew immediately that the ROG3 was going to work as soon as I started to scrub. I could tell that the dirt was lifting up off the floor. No more scrubbing bubbles, cleanser, vinegar etc. for me. If I can’t get my hands on ROG3, I’m removing the shower pan. Great Product! These ROG 3 Cleaner Reviews are 100% real from real customers. If you’d like to see more ROG 3 Cleaner Reviews you can check out our product in action on our youtube channel. Also, if you’d like to try out an ROG 3 Kit yourself, you can order one here on our website! I used to scrub, scrub, scrub the bottom of my tubs/showers to no avail. Simply spraying this stuff on was enough to dislodge dirt that I thought had been CAKED on. This makes your tub SHIIIINE. I also used ROG 1. My fiberglass shower stall insert was almost black after 15 years of use. I had tried every product available, even bleach, oven cleaner and all abrasive cleaners. They all failed so I tried to steam it with a Shark steam cleaner, that failed. I purchased ROG-3 and after one application the soap scum and dirt were gone ! I let it sit for 5-8 minutes and used the provided scrubby and I am amazed. My shower stall looks absolutely new, not kidding, it is the best product I have ever purchased and any one who says it did not work either did not use it properly or they are a liar ! Do not waste your time and money on other cleaners fot fiberglass, they will not work. Get ROG-3, it is worth every penny. No matter how many times I cleaned my tub the non-slip treads always looked dirty. After R.O.G. they’re barely visible! My tub looks new. Ten years ago, I moved into a condo that had all cheap, entry level appliances and fixtures, the white fiberglass shower insert included. For years, I have scrubbed and scrubbed that shower, and there are always stains, soap scum, and weird little things stuck to the walls, no matter what I do. I had even been considering replacing it. Then, I found the ROG products here on Amazon and I decided to give it a shot. I used the cream on the non-skid floor twice, and scrubbed it with the ROG scrubber, and now the non-skid floor is clean as a whistle. Same goes for the rest of the shower… I used the blue foaming spray once – sprayed down the entire shower insert and let it sit for a bit, then scrubbed it a bit with the ROG scrubber, and now I have a super sparkly, like-new shower. Every time I go into the bathroom, I peek behind the shower curtain to see my sparkly shower.